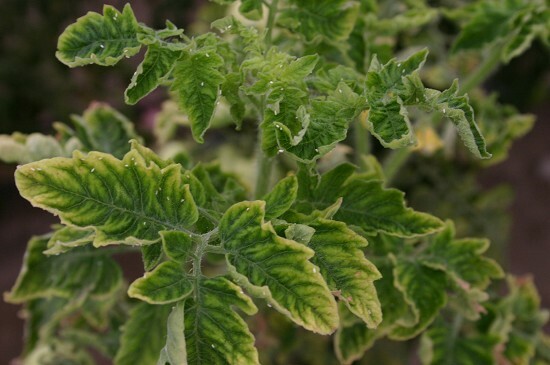 TYLCV: Tomato yellow leaf curl virus (TYLCV), a disease that threatens both commercial tomato production fields and home gardens, was identified in March 2007 by Dr. Robert Gilbertson, University of California Davis (UCD), in greenhouse tomato samples from Brawley, California. TYLCV is transmitted by adult silverleaf whiteflies (Bemisia tabaci Biotype B = Bemisia argentifolii) and can spread rapidly, but TYLCV is not trasmitted through seed or by mechanical transmission. The presence of silverleaf whitefly host plants, both cultivated (i.e., peppers and tomatoes) or wild hosts (i.e., sowthistle, cheeseweed and nightshade weeds) during spring and summer may lead to whitefly migration and spread of TYLCV. During late spring, summer, and early fall, growers need to monitor whitefly populations very closely and destroy whitefly weed hosts and crop residues (i.e., melons and cotton). TYLCV has a broad host range from several plant families including Solanaceae (tomato, peppers, various nightshade weeds, and ornamental plants), Malvaceae (cheeseweed), and Fabaceae (beans). at an early stage won't bear fruit and their growth will be severely stunted. similar symptoms can be caused by other viruses or various growing onditions. Extension Office and will be shipped to Dr. Robert Gilbertson at UCD. Management Recommendations: 1) Use only virus- and whitefly-free tomato and pepper transplants. Transplants should be treated with Capture (bifenthrin) or Venom (dinotefuran) for whitefly adults and Oberon for eggs and nymphs. Imidacloprid or thiamethoxam should used in transplant houses at least 7 days before shipping. Transplants should be produced in areas well away from tomato and pepper production fields. 2) Use a neonicotinoid insecticide, such as dinotefuran (Venom) imidacloprid (AdmirePro, Alias, Nuprid, Widow, and others) or thiamethoxam (Platinum), as a soil application or through the drip irrigation system at transplanting of tomatoes or peppers. After the efficacy of the neonicotinoid insecticide application begins to decline, the secondary spread of whiteflies will need to be controlled. Monitor whitefly populations throughout the season, treating when present. Rotate insecticide classes for insecticide resistance management (IRM). Foliar insecticide treatments used in IRM for whitefly control include: Capture, a pyrethroid; foliar neonicotinoid insecticides dinotefuran (Venom), imidacloprid (Provado), and thiamethoxam (Actara), but do not use if a neonicotinoid insecticide was applied as a soil or drip irrigation treatment; insect growth regulators such as pyriproxyfen (Knack) and buprofezin (Courier); insecticidal soap; and crop oils. A highly UV-reflective mulches (metalized) and low rates of crop oil (0.25 -0.50 percent) can be used as whitefly repellents to reduce whitefly feeding and virus transmission. 3) Sanitation is very important for preventing the migration of whitefly adults and the spread of TYLCV. Rogue tomato or pepper plants with early symptoms of TYLCV from fields by placing infected-looking plants in plastic bags immediately at the beginning season, especially during first 3-4 weeks. Maintain good weed control in the field and surrounding areas. Prevent the spread of any whiteflies to healthy plants. Tomato and pepper fields should be cleaned up immediately after harvest. Also destroy crop residues of melons and cotton immediately after harvest to reduce whitefly migration.